Experience our Biofinity® Energys™ story. Click here. Increased accommodative burden. Reduced blinking. Frequent changes of focal distance. Digital devices are an everyday part of life, but all that screen time takes a toll on your patients’ eyes. Now there is the breakthrough of Biofinity Energys, the contact lens innovation made for today's digital lives. Biofinity Energys contact lenses feature Digital Zone Optics™, which helps with eye tiredness caused by focusing on close-up digital devices. It’s a unique simulation of additional power across the entire optic zone, so wearers can change focus from on-screen to off-screen and back with less effort. And, it fits like a single-vision lens. Biofinity Energys contact lenses also feature Aquaform® Technology. This attracts and binds water throughout the lens material to retain moisture – natural wettability that can help your eyes feel less dry. That’s important because spending significant amounts of time staring at a screen causes blink rates to reduce, resulting in dry, itchy or burning eyes. Biofinity Energys contact lenses meet the same high-performance standards that have always defined the Biofinity family of products, including an optimal balance of optics and lens material. Your patients’ busy lives happen on-screen and off. Help them experience the contact lens designed for the way they live. 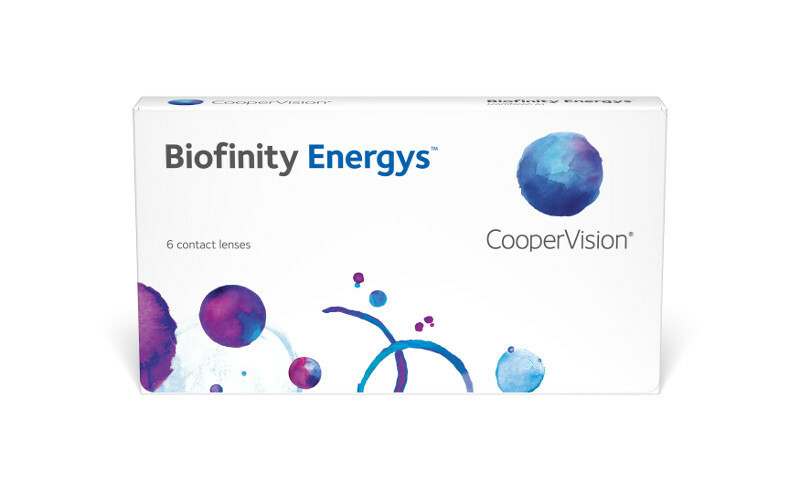 Ask your CooperVision representative about new Biofinity Energys contact lenses. * Among patients who use digital devices at least four hours per day, at least five days per week and self-report symptoms of eye fatigue at least once per week. ** After one week of wear. Data on file.